When putting together your strategic rollout plan when launching an online collaboration platform, crafting an approach that’s a good fit with your corporate culture is key to getting traction. Your unique corporate culture influences how adoption propagates through the organization. How does information travel? Who do people listen to? What’s the best way to spread the word? These are questions only you can answer. That said, from our years of helping our customers manage their successful launches of Redbooth, there are some best practices all organizations can use to ensure their launch gets off on the best foot possible. Viral—Announce the platform, tell everyone how to enroll, sit back, and let people join and invite coworkers. This passive, “if you build it, they will come” approach is often the way organizations first use collaboration platforms. However, the viral method is unpredictable, rarely leading to widespread adoption on its own. Managed rollout—Deploy according to a phased plan, first to the departments that will benefit most. Metering availability helps organizations scale support resources, adjust as needed, and focus on working with power users and champions to gain traction. This high-touch approach works well in larger enterprises or highly segmented organizations. Complete migration—Release the platform to the entire organization at once. This “do-or-die” method works well as a final step of a managed rollout, or for highly integrated organizations with a competitive culture that quickly engages with new initiatives or technologies. Personal motivations. It’s impossible to overstate the critical need to understand and convey the “What’s in it for me?” message to your user groups. Align underlying personal motivations for adoption with concrete examples of the advantages the platform provides. For example, the CEO wants to see that the platform gathers and stores organizational knowledge, so if a team member goes on vacation, someone else can step in and cover for that person with minimal transition time. Or the administrative assistant can use the task manager and reporting capabilities to receive and resolve requests, with fewer interruptions during the day. Don’t overlook the value of rewarding participation with incentives such as gift cards, but you can also recognize power users and champions on leader boards or awards presented during company events, such as an all-hands meeting. Seeding practices. Conventional marketing practices such as advertising and events help get the word out and capture user interest. Never underestimate the grassroots value of power users and champions, who can provide one-on-one, personal coaching and encouragement to their immediate teams. Casual events such as lunch & learns offer another way to demonstrate the tool to skeptical, but hungry, users. Finally, using the platform as the only way to access and manage content vital to a certain project pulls even the most reluctant users on board. Don’t assume that your user base has the bandwidth (or interest) to pay much attention to your rollout. Communicate with users at every step: before something happens, as it occurs, and after it’s done. Begin with drafting email blasts: one set from the rollout team, and another set that managers can personalize and distribute to teams to encourage participation. We’ve also created a template you can copy and edit to suit your needs. Training. People won’t use a system they don’t understand. Training takes several forms: formal onsite or online classes, self-serve video-on-demand, and one-on-one informal coaching. You can purchase formal training from your collaboration platform vendor, use its online knowledgebase, or leverage its white-label training materials. Some organizations choose to multiply the value of formal training by providing it to champions, who then take responsibility for individually training people in their groups. Helpdesk support. Many organizations have a helpdesk that fields questions from users and helps them navigate the many systems they use to do their jobs. Early engagement of helpdesk personnel creates a partnership supporting ultimate success. The collaboration provider typically has a knowledgebase that your helpdesk personnel can access to assist struggling users. Support and discussion forum. No rollout proceeds exactly as planned. Successful rollouts gather feedback during the process and adjust resources and processes in response. Leverage your corporate social platform or wiki pages to solicit feedback during the rollout, spotlight user-designed task list templates and process flows, and tell engaging stories about how users are “owning” the platform to improve business processes. Overlapping systems. 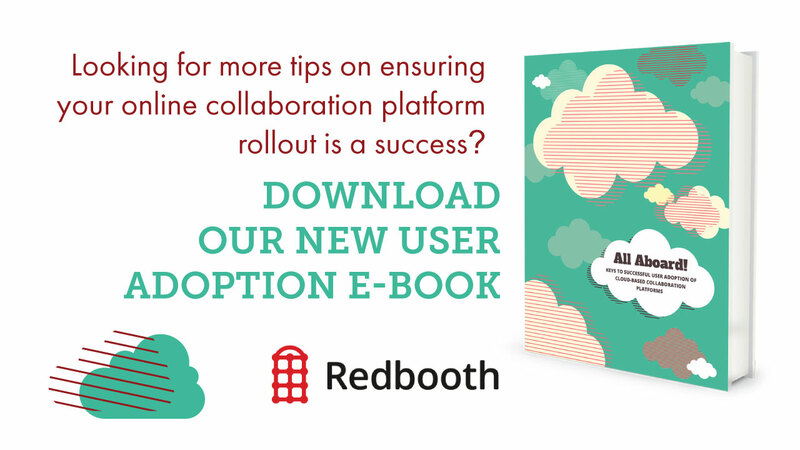 Your organization may have pockets of users that already use a collaboration platform—just not the one you’re rolling out. Reach out to those groups. Make agreements about how the company will use each system during the rollout. Assuming you’ve managed a successful rollout and enjoyed enthusiastic user adoption, you need a final cutover plan for these users. A successful transition includes data migration from other systems into your platform and ample advance notice to affected users of the cutover plan and shutdown date. How is the collaboration platform changing the way people interact? Can you measure improvements in business processes? Do people meet deadlines more consistently? Do managers sleep better at night during a product launch? Finally, be sure to publicly acknowledge and congratulate the many people who contributed to your launch’s success!